As my previous posts have discussed, most of the press on the exciting new LiDAR data around Angkor have focused on the supposedly “lost city” on Phnom Kulen. 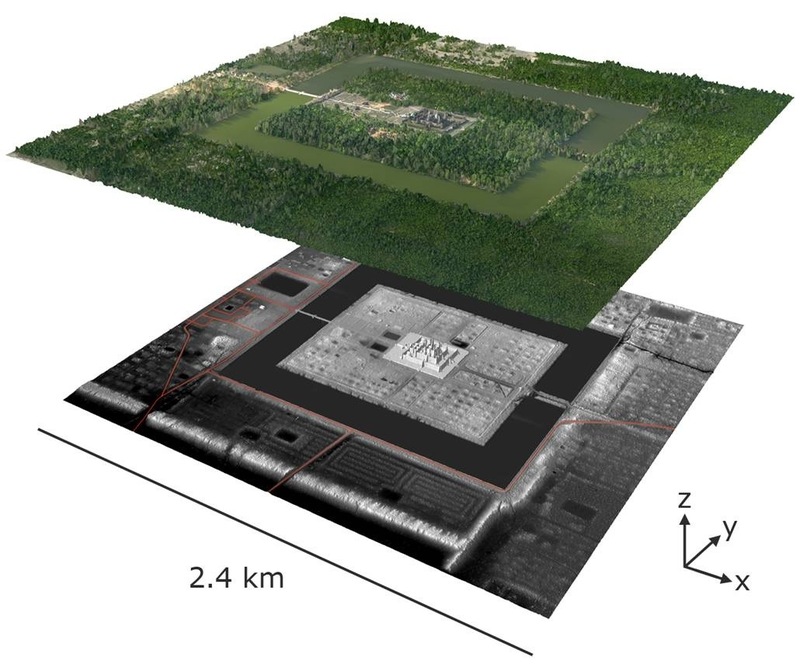 However, the LiDAR data covered a huge area around Angkor, especially around the urban core, and what those results revealed are just as exciting. An article in this weekend’s Guardian newspaper mentions some of our fieldwork, headed by Dr. Miriam Stark. However, I was disappointed when an associated article with the headline Laser technology reveals lost city around Angkor Wat focused primarily on the work on Phnom Kulen (actually not anywhere near Angkor Wat). I’m completely biased, but I think the work we’re doing at Angkor Wat is important and exciting, so I thought it was time to discuss it a bit more here. 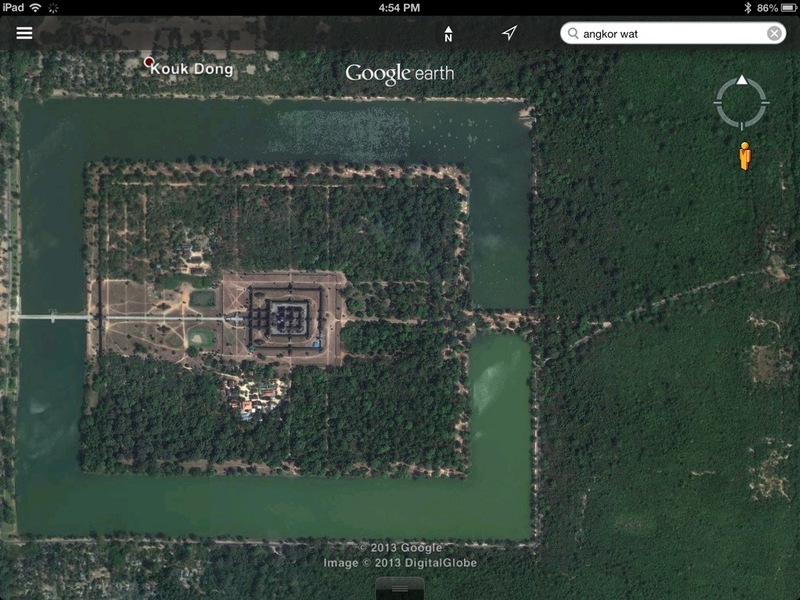 If you look at a Google Earth image of Angkor Wat, you’ll notice several things. First and foremost is the temple itself, which is inside a laterite wall and surrounded by a moat. Outside of the moat is more forest and the area inside the wall and next to the temple is also heavily forested. Above: A Google Earth image of Angkor Wat. This is where the magic of LiDAR comes in, as it is able to see through the trees into the microtopography of the landscape below. Here you can see the image of the trees peeled off and a series of features underneath, surrounding the temple. There are several things that pop-out in this LiDAR data. First is that around the temple of Angkor Wat is a grid pattern of mounds and depressions AND that this grid system continues outside the moat. South of Angkor Wat is a series of square spirals, that are currently a bit of a mystery. (However Damian Evans has already warned us about over-thinking these features. My untested hypothesis leans towards something similar to a planned garden a la Versailles). The grid system inside the walls and surrounding the temple of Angkor Wat is what the Greater Angkor Project, of which I am a member, is currently investigating. Our initial hypothesis is that these were occupation mounds and possibly ponds or low-lying areas, and remnants of a planned city inside the Angkor Wat enclosure. There also appear to be some possible roads running through this series of mounds and depressions. Excavations in 2010, confirmed that these mounds were used for habitation, however this was before the LiDAR data and our more complete understanding of the broader grid system. Our current excavations focus on the SE quadrant of the Angkor Wat enclosure, an area where the series of depressions (ponds?) and mounds is especially well preserved. 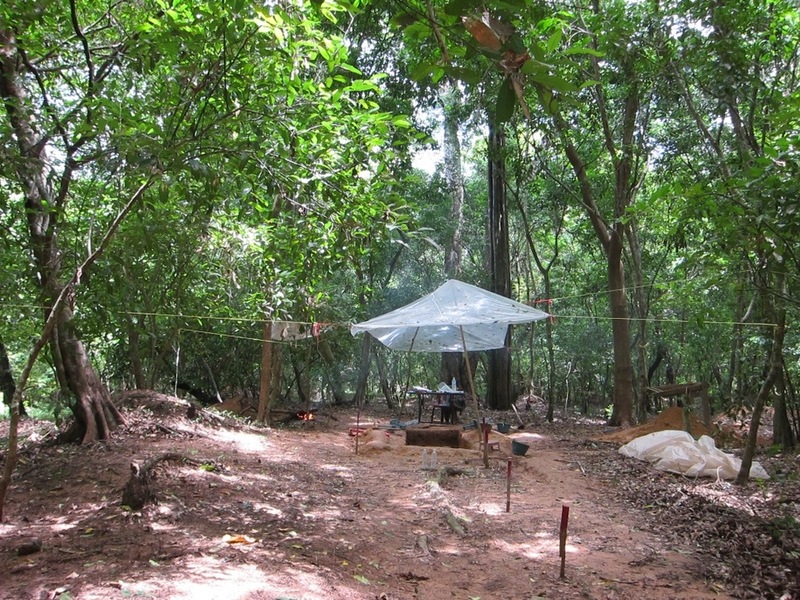 Our new series of excavations has produced continued evidence of habitation at Angkor Wat. 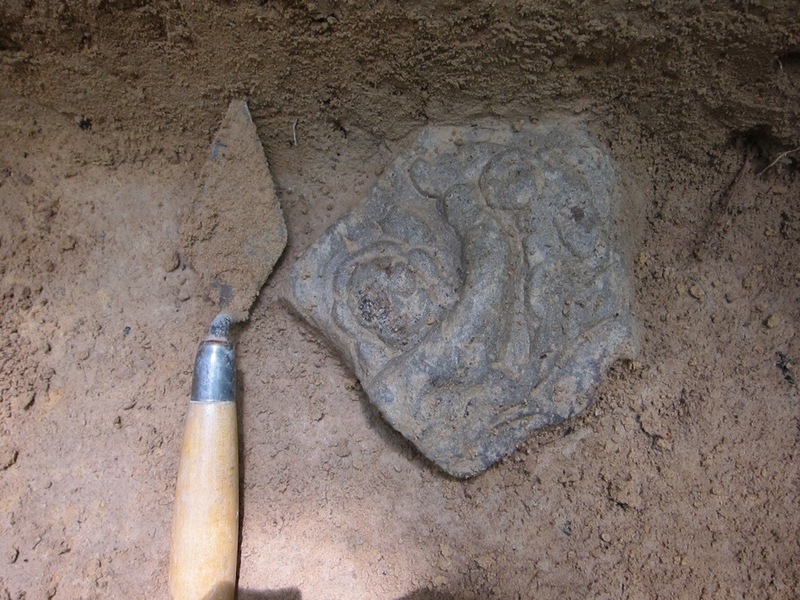 We’re uncovering many fragments of earthenware vessels that were likely used in cooking as well as Angkorian glazed stoneware ceramics, and Chinese tradewares that date to the 12th century, which coincides with the construction of Angkor Wat. Above: A scattering of ceramics on the surface of an excavation unit at Angkor Wat. These may be related to an occupation floor. Below: A close-up of a Chinese tradeware vessel with a handle, in situ. In a unit I’m supervising we’re finding lots of stone, especially sandstone, that was presumably being recycled from the construction of Angkor Wat. What this stone is being used for is still up for interpretation. Some pieces could be mixed with dirt for house fill. While other pieces, you can see in the image below, are arranged on a flat surface and these appear to present something akin to a living floor. 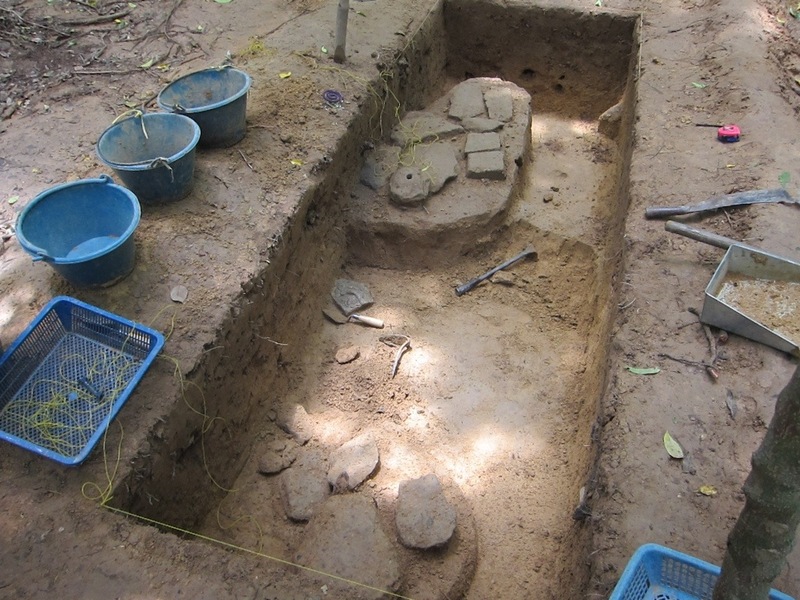 Above: An excavation unit showing a series of stones likely related to house construction or occupation at Angkor Wat. We even found a discarded piece of carved stone, that appears to have been recycled for house construction (below). -Who were the people who were living here? People who worked at Angkor Wat, like priests, dancers, stone carvers, or other people who supported the temple? Or were they regular city-dwellers with little to do with the day to day function of Angkor Wat? -Were these elite residences or residences of people who were more common? -Did people live here year-round or were these mounds only occupied during important festivals or rituals? -What is the relationship between the occupation inside the wall and outside the wall? -How long did people live here for-just during the Angkorian period or into the post-Angkorian? Despite these ongoing questions, it is significant is the scale and organization of urban core of Angkor, including around the Angkor Wat temple. Again, this is not entirely new, as many researchers suspected and even saw evidence for a city around the temple of Angkor Wat. ** However, this LiDAR data, paired with archaeological excavation, is giving us a new and more in-depth understanding of this civilization. Most research has focused on the temples and inscriptions of the very elite members of the Angkorian civilization and yet we know that thousands of regular people lived here and made the city work. This is the power of archaeological research, to give a voice to these parts of the past. Stay tuned for more updates as our work progresses. **Jacques and Freeman (2009: 46) mention this city, I think based on BP Groslier’s work, although I don’t have an original citation for this hypothesis and would appreciate any suggestions of where to look. Thanks also to Damian Evans for the LiDAR image of Angkor Wat. This entry was posted in Archaeology, Travels around Cambodia. Bookmark the permalink. Well done Alison! You’re certainly better at blogging in the field than I am 🙂 Miss you guys, send my regards to neakrou and the team. Hello, I am looking for someone knowledgeable in regards to the underlying construction of the Angkor Wat. Does anyone study the basic construction underneath? What kind of stones were used to construct the waterways surrounding the temple. Does anyone here know about the underlying construction under the water and beneath the Temple. Is everything entirely constructed using sandstone? Ok will check that out. Does it cover how, for example, the moats surrounding the temple are constructed? 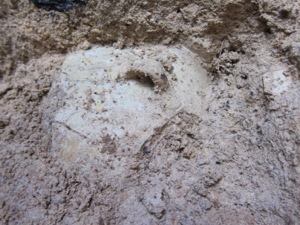 I’m not sure, but we can see the process in our excavations. They were dug out by hand and the the extra earth appears to have been used to help build up the interior of the walled area. Sorry, this comment made me laugh a little. The point of this excavation is NOT to develop more tourists for Angkor Wat. In fact, many might argue that Angkor Wat actually needs less tourists. 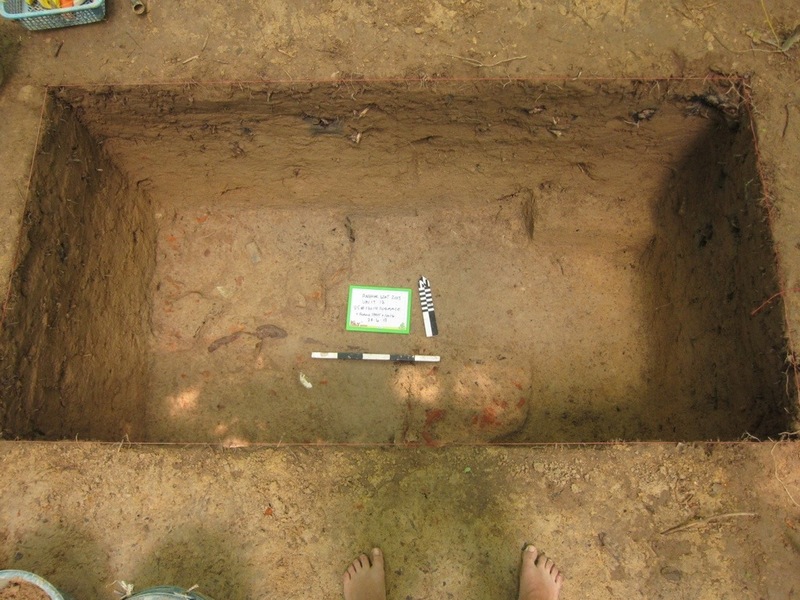 The goal of the excavation is to find out more about how people actually lived during the Angkorian period. oh, you are so right – Angkor Wat and dicovered lost city on Phnom Kulen needs to be secured ….Cambodia is since as a virgin in the world. You have lot of opportunities to keep them safe. I have a hypothesis about Angkor Wat which i think may interest you, i have evidence that could prove it was not built in the first half of the 12th century by Suryavarman II but much earlier. Well, having a hypothesis about this is perfectly reasonable. But I can tell you from actually excavating at Angkor Wat that we have multiple lines of evidence supporting the early 12th century dates. Firstly are multiple radiocarbon dates from early habitation layers found at multiple locations within the enclosure. Secondly from Chinese tradeware ceramics, which are well dated. Ceramics are common and in the case of Chinese tradewares that are well studied, quite reliable for dating. People who are living and working at Angkor had to have been using ceramics for food, cooking, and storage and they leave these remains in copious amounts. Having also studied the Iron Age period, I’m quite aware of what earlier period ceramics look like, and my extremely knowledgable colleagues would be able to identify them if they were found. There is plenty of evidence for prehistoric peoples living in the Angkorian period, but there is not strong evidence to support the hypothesis that Angkor Wat was constructed at a much earlier date. Furthermore, we must also look at your qualifications to make this bold statement. Have you a degree in archaeology or anthropology? These are serious scientific fields that require proper training in both theories and methods. Without this training it is easy to misunderstand archaeological data. Do you speak/read/write Khmer? Do you have permits to undertake research with the Cambodian government and collaborate with Cambodian scholars? These are all fundamentals of undertaking scientific research. To “prove” this is true, you must also have an explanation as to why we find the current evidence supporting the 12th century dates. There is a misconception that academically trained archaeologists are trying to keep secrets buried from the public for some nefarious unexplained reason. In fact, big-game changing hypotheses are welcomed and in fact career-making. As someone looking for a job at the moment I would love to make this big discovery. But this always, always has to be backed up with real material evidence that can be independently verified and substantiated by your peers.